This is a scalable context timeline. It contains events related to the event April 16, 1997: Justice Department Report Criticizing FBI Crime Lab May Impact McVeigh Trial. You can narrow or broaden the context of this timeline by adjusting the zoom level. The lower the scale, the more relevant the items on average will be, while the higher the scale, the less relevant the items, on average, will be. 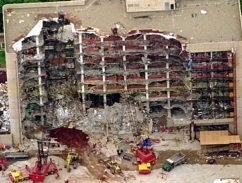 Lawyers for convicted Oklahoma City bomber Timothy McVeigh (see June 2, 1997 and June 11-13, 1997) ask Judge Richard P. Matsch for a new trial. They cite a number of reasons for the request, including what they call juror misconduct. Lead lawyer Stephen Jones says that jurors violated an order by Matsch not to discuss the case among themselves before they began their deliberations, referring to a conversation held on May 9 in which one juror allegedly said during a break, “I think we all know what the verdict should be.” Matsch was made aware of the conversation and decided it warranted no action. However, Jones says the conversation proves that McVeigh did not have “an impartial jury.” Jones also says McVeigh was denied a fair trial by Matsch’s ruling that the defense could not introduce into evidence a Justice Department report that criticized practices at the FBI crime laboratory (see January 27, 1997 and April 16, 1997). Jones also attacks Matsch’s refusal to allow the testimony of federal informant Carole Howe (see May 23, 1997), which might have led the jury to conclude that “the government failed to investigate leads which concerned a larger conspiracy to bomb the Federal Building in Oklahoma.” Matsch ruled that Howe’s testimony would have been irrelevant to the charges against McVeigh. “Had the defense been allowed to admit Howe’s testimony and present evidence that others may have committed the bombing,” Jones argues, “the seeds of reasonable doubt would have been planted in the minds of the jurors.” [New York Times, 7/8/1997] Prosecutors will oppose the request, calling the trial “scrupulously fair” and “close to perfect” in its handling. [New York Times, 7/25/1997] Matsch will deny the request (see August 12, 1997).